What Does Cyber Security Consist of in the Cloud? Use of cloud computing has been advancing since 2008, and shows no evidence of slowing down. While many have concerns about security and the cloud, few can imagine a future without it, just as few can imagine a future without the internet -- despite all our security concerns. Regardless of upswings in data breaches each year, organizations and businesses continue to invest in cloud computing services because of the benefits they offer. Quite simply, cloud computing is the provision of computing services, including storage, databases, servers, software, networking, intelligence, and analytics over the internet (or, the cloud). The cloud offers flexible resources and greater efficiency, with the user scaling services as needs change. Cloud computing isn't constrained by physical limits, so is perfect for start-ups who can scale up as needed. All you need is an internet connection and a browser. With cloud computing, the user can eliminate the need for investing in buying hardware and software; setting up on-site data centers; 24/7 electricity for power and cooling; plus the services of IT experts. For instance, an on-site data center may require extensive hardware setup, software patching, and lots of other IT management tasks. Cloud computing negates the need for some of these tasks; that way, IT teams can spend more time taking care of business. Since most cloud computing services are on demand and self-service, vast computing resources can be available in mere minutes, so that businesses have more flexibility, and don't have to plan to exact capacity. Cloud computing allows the delivery of the right amount of IT resources, including storage, bandwidth, and computing power -- as it's needed. Cloud computer users have access to a worldwide network of secure data centers, regularly upgraded to the most recent generation of efficient, fast hardware. Cloud providers are likely to offer the latest technologies and controls to strengthen security overall, so that the user's data, apps, and infrastructure are protected from threats. There are public and private clouds, as well as a hybrid type of both clouds, with each offering differing ways of delivering services and operation. Since clouds are often composed of multiple entities, security depends on the weakest link. This linking between entities means that an attack can be launched to multiple sites simultaneously. Cloud providers that do not offer the best cyber security measures are likely to be a target for cyber criminals. Leaks or exposures of sensitive information, including credit card and social security numbers, usernames, and passwords, is a data breach. The organization that uses the cloud service is considered accountable for keeping data secure. Cloud services providers maintain a high level of security, but CSA warns organizations should deploy multi-factor authentication and encryption systems on the user end to foil data hacks. It's crucial for the cyber security specialist to have some training in cloud computing, in addition to training in cyber and network security. One of the best ways to do that is through formal training. Cloud computing is so pervasive today that most cyber security specialists also need some training in this field. Whether you work for a government organization or business, you will need skills in maintaining network and security hardware and software, as well as network security design and assisting in development and implementation of disaster recovery policies. You'll also need the latest skills in troubleshooting, plus familiarity with tactics for assessing threats and crafting responses. A college program that gives you hands-on instruction with the same technology found in the modern workplace can be beneficial in reaching these goals. Learning to build secure networks in Cisco, Windows and Linux environments will give you the basic skills you need to protect your employer and their customers' data. Are you interested in cloud computing? 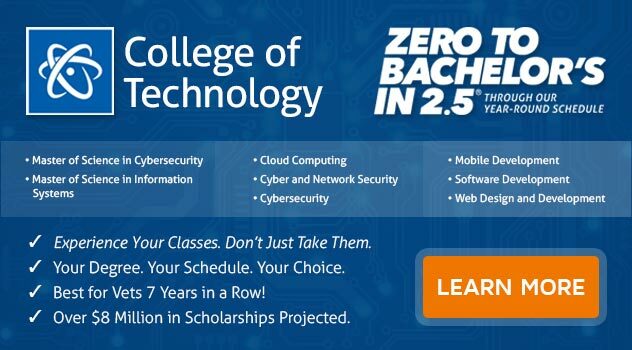 If you want to earn a Bachelor of Science Degree in Computer and Information Science with a Major in Cyber and Network Security - Cloud Computing Track, ECPI University offers this program at an accelerated pace. For more information, connect with a helpful admissions advisor today.